Sometimes, adapting fairy tales into other forms can provide some unique challenges. There are things like story structure and character to consider. Also, the question of how to make such old stories resonate with modern audiences. But here’s a challenge that probably doesn’t come up much: how do you turn a relatively short tale like “Cinderella” into a 26 episode cartoon series. Interest piqued? Good. Cinderella Monogatari aka The Story of Cinderella aka Cinderella is a Japanese-Italian coproduction made by Tatsunoko Productions and Mondo TV. It originally aired in 1996. I know you all know the story of Cinderella, but humor me here. There are a few differences. 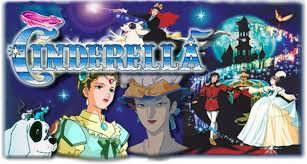 The story follows a girl named Cinderella who is the daughter of a wealthy duke. 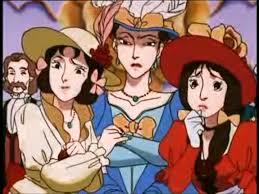 She also has a stepmother and two stepsisters named Jeanne and Catherine. When the Duke leaves on a long business trip, the Stepmother immediately moves her own daughters into Cinderella’s room, banishes her to the attic and turns Cinderella into a servant in her own home. The story generally follows Cinderella as she copes with her new situation. Though, she does have some help. Her fairy godmother Paulette works small feats of magic without Cinderella noticing to make her life a little easier. She also has her animal friends Patch the dog, Pappy the bird and the two mice Bingo and Chuchu, who’ve all been enchanted by Paulette so that Cinderella can understand them when they talk, though no one else can. She also makes friends with a young page from the castle named Charles, who is (you guessed it) secretly the prince in disguise. Yeah, it’s a pretty common trope for Cinderella retellings now for her to meet the prince earlier and not know it’s him. But you have to expect that with a version of Cinderella that goes for 26 half-hour episodes. So, pretty much the entire series exists in the space between when Cinderella’s stepmother starts making her life miserable and when the royal ball is announced. In all honesty, there was probably nowhere else to put it. However, that space is filled with a lot of material. There are many schemes by Cinderella’s stepmother to somehow marry either Jeanne or Catherine to the prince. She meets all sorts of people like actors, circus performers and fortune tellers who become her friends. She even encounters some magic, like a painter who can trap his subjects’ souls in his paintings and an enchanted forest. There’s also another villain in the mix who makes things difficult. Duke Zarel is a scheming courtier who wants to take the throne by either marrying the prince to his own daughter Isabelle or with just a good old fashioned coup. 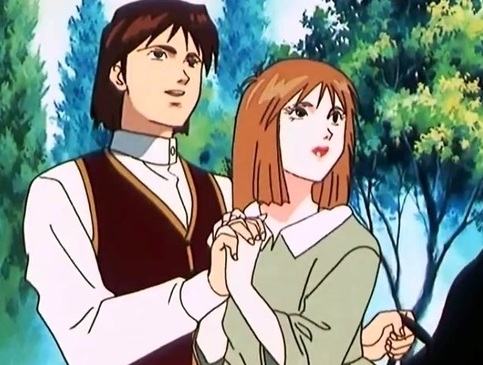 Cinderella faces all this while getting closer to the boy she calls Charles the Fibber (she catches him in a lie early on). It’s an entertaining enough show. Nothing groundbreaking, really. But some of the details are rather interesting. For example, the character of Paulette, the Fairy Godmother (who’s depicted as sort of a wandering artist, by the way). In one episode, we get a flashback to her friendship with Cinderella’s mother. It’s something most people don’t really think about. To be her godmother, at one point Cinderella’s parents had to have known her. We don’t get to see how the two met. Though, they both liked to paint. We do get to see Paulette promise to look after Cinderella when Cinderella’s mother knew she was going to die. In that same episode, we also see what seems like a riff on the Grimm version “Aschenputtel”, involving the spirit of Cinderella’s mother and a favorite tree. Later, when the show finally gets around to the actual familiar part of the story, we see the glass slippers and are told they’re an heirloom from Cinderella’s mother. It invests those shoes with even more emotional significance and explains why they don’t disappear with the rest of Paulette’s spell (admittedly, Ever After also did something like this). Even beyond story elements, it can be interesting to see anime stylistic choices applied to a Western fairy tale. For example, with lots of sparkles and a more abstract background than we usually see, Cinderella getting magically dressed up for the ball looks kind of like a really subdued magical girl transformation. Not all of it is good. Cinderella can seem a bit too passive for a lot of modern audiences. Even when the show has the ability to remedy that, it doesn’t. I remember one episode where Cinderella is worried about the safety of her home for various plot-related reasons. So, she goes and asks Charles to teach her how to use a sword. They have a little back-and-forth over it as they often do. Then they change scenes and the next time we see them she’s thanking him for the lesson and him saying she was a very quick study. That’s it. They don’t show much of the training and they never even show her picking up a sword. When Duke Zarel’s thugs do break into the house, she hides under the table and trips them as they go by. Charles is the only one who engages in any swordplay. 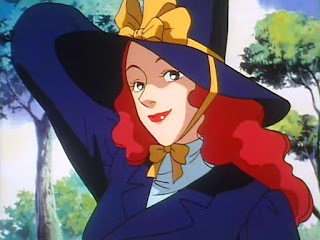 Pretty much the only reason they had that scene that I can think of is as an excuse to put Cinderella in a silly Musketeer costume, which they do. Now if you’re wondering when the actual “Cinderella” story actually happens, they cover the last three episodes. Though, they also go a little farther to Cinderella’s wedding and another appearance by Duke Zarel. Overall, this is a decent show. Not a must see. It gives the story a tweak rather than a full-on twist, but that’s not necessarily bad. I’d suggest watching it, but you don’t have to give it undivided attention. You can put it on while ironing or doing the dishes, etc. (Cinderella-like chores, basically). It’s available on Amazon Instant Video now and I think it's included if you have a Prime membership. I should warn you guys now though, this isn’t quite the end. These people also made a Snow White show. But that’s for another post. Fantasy Literature Rewind: Mary Poppins. 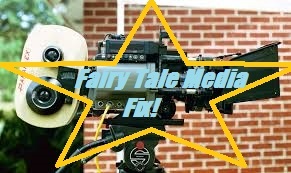 Fairy Tale Media Fix: Snow Queen musical.